RAPAPORT... De Beers sightholders are bracing for lower rough supply for the rest of 2019 as the miner reduces its production and fulfills its commitments to support local manufacturing in Africa. The company expects production to drop as its Victor mine in Canada closes and the Venetia operation in South Africa shifts from open-pit to underground mining. It has predicted output of 31 million to 33 million carats this year, compared with 35.3 million carats in 2018. A smaller quantity of rough diamonds will therefore be available during the new sales period starting next month compared with the current one, the miner confirmed. It informed sightholders of their provisional allocations ahead of last week’s April sight, and will decide their final allotments before the next sale begins on May 13. De Beers allocates rough diamonds based on clients’ purchases in the previous intention-to-offer (ITO) period — a policy known as “demonstrated demand.” Prospective sightholders tell De Beers how much rough they will require during the period — their “intention to offer” — with the miner subsequently informing them how much they will receive. Last week’s sight was the last of the current ITO period, which began a year ago. The new period will run from the May sight until the end of December, featuring only seven sights rather than the usual 10, as De Beers is moving to a calendar-year ITO. 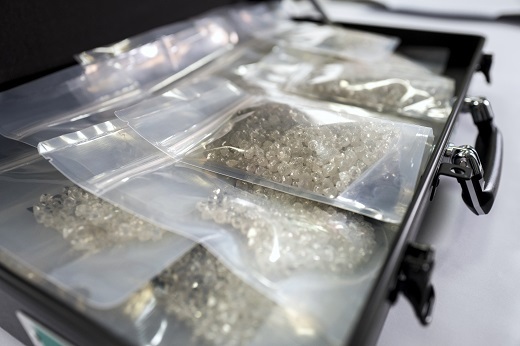 Because of that shorter period, total supply will be lower, but it will also decline on a per-sight basis, said David Johnson, De Beers’ senior manager for media and commercial communications. The lower supply is especially acute in larger diamond sizes, sightholders told Rapaport News. Separately, the reduction will have a bigger impact on companies that take part in its core sales plan, known as the international sight. Customers with Botswana or Namibia sights — who buy rough for manufacturing in those countries — tend to be less affected when availability drops, Johnson explained. That’s because the miner’s agreements with governments require the company to allocate certain quantities of goods to those clients, he continued. De Beers earmarks 15% of Botswana production for Okavango Diamond Company, a state-owned seller of rough goods, and offers the remaining 85% through Global Sightholder Sales (GSS), its contract-sales division. It sells most of those GSS goods to international sightholders, but also commits to offering an agreed dollar amount to Botswana sightholders for the benefit of the local cutting industry. The 2011 deal that governs those arrangements is up for renewal next year. The miner operates a similar regime with the Namibia government, with 15% of production going to state-owned trader Namdia, and additional goods becoming available to Namibia sightholders. That 2016 deal prompted De Beers to reduce its supply to international sightholders the following year. De Beers is due to release the sales total for the April sight on Tuesday. Prices were stable compared with the previous sight, a broker reported.